I think Obama's heart is in the right place, and he talks a good game, but he's been naive and weak, and the Republicans have preyed upon that. Hillary would be a stronger president who would be better able to stand up to Republican bullying. Yes, Hillary should run so we can have a Republican president again. Hillary Clinton vs. Sarah Palin? Really, Jack? In your heart, you know who would win that. I don't care how badly tarnished the Democrats are right now. Maybe the Clintons are preparing to run against Obama. You guys would love the TV ratings for that and after all that is all the media really cares about. I think the only way to keep the presidency from falling into the Republicans' lap is if Hillary runs. Obama doesn't stand a chance unless he starts performing miracles for the next two years, and I really don't see that happening. If she feels she can do a better job, why shouldn't she challenge him? It happens all the time in private industry. It's not illegal. So why not? I love Hillary Clinton and think she is an amazing leader. I supported her throughout the nomination and I still would rather have had her be our current commander-in-chief. That being said, the only way that Hillary should run for president in 2012 is if Obama steps down and decides not to run for re-election. I hope she will! We didn't want her in 2008 but we sure need her now! Boy, are we paying now. We need someone with a backbone in office. Please, Hillary, run! Jack, Are you trying to give me nightmares? Perhaps President Obama should do what LBJ did and refuse to accept nomination from his party. Only then should Hillary Clinton run. The comparison to Baum's "Oz" is too tempting. Hillary, the good witch of the North takes on Sarah, the wicked witch of the West. The question is who will play the roll of Dorothy? Perhaps Chelsea or Bristol, perhaps. Now that is silly, Jack. I remember how hard Bill and Hillary Clinton tried to get health care reform for America during the Clinton Presidency. Perhaps Bill Clinton campaigned so hard because he believes in this Administration. Perhaps cynicism against the whole world isn't always warranted. YES, Hillary should! There is nobody else who is qualified. In the first place, she should have been the nominee in 08!! I'm hoping for a challenge from Hillary in 2010. However, for party unity, Obama should just ask Hillary to be his VP. If Hillary is not on the ticket, I sure will havea difficult time voting Obama again. Maybe Americans are tired of trying to make history this last history making event went sour . Everyone knows that the sitting president almost always gets his parties nomination for a second term. Hillary Clinton would be making a big mistake by challenging the president in 2012. If she really wants to run for president, she should wait until 2016. The Republicans have got a golden ticket here and I hope they can capitalize on it by nominating a contender who knows what they are doing. If they nominate Sarah Palin, then that will just give President Obama a second term. Come on now lets not start the conspiracy theories. It is common knowledge that the sitting Secretary of State does not hit campaign trail. There is nothing to the fact that she is 9000 miles away. As far as Hillary Clinton running for office, I believe that she is smart enough to realize that would hurt the party more than it would help. No she should not run. ABSOLUTELY! Many Hillary supporters (such as myself) feel she should have had the nomination to begin with in 2008. But what's done is done. I am a Democratic supporter but voted for McCain/Palin because I did not think Obama was "ready for prime time", especially during such challenging times for our country. Two years later, my fears have unfortunately become a reality. Hillary would not have to run on the Obama record as the Democratic nominee. As Secretary of State, she has maintained her popularity among Democrats, Independents and even some Republicans. At the very least, Hillary needs to be on the ticket to re-energize the base. Otherwise, look for President Obama to become this generation's version of President Carter... One liberal agenda term and out! Wow - sitting President vs. his sitting Secretary of State? That could make for some interesting cabinet meetings. No Jack. But, Barack Obama should instead choose not to run for a second term. He will be remembered most for healthcare, but one fact remains that is never talked about. The republicans have wanted to dismantle medicare ever since it was created. Healthcare reform never had a chance under any circumstances. I would like to see Hillary run for President. But she of course will have to deal with the likes of Mr. Arrogant in Chief, Mr. O'Connell. How in the world do republicans hope to ever gain a consensus of any kind with democrats with morons like him? As VP in 2012 and President in 2016 and 2020 is a far better strategy for the party . Obama is doing fine, if Hillary challenges it will make her years as Secretary of State seem hypocritical. I'm from Nigeria and live in England. If you guys don't want him, I can say that either of those countries would be extremely happy to have him. He's a class act, and you should be counting your blessings. No one is worse than the clown in the WH. Hillary is like the messiah compared to him, and believe me I am no demoncrat. Yes, Clinton definitely should challenge President Obama in 2012. I voted for Obama in 2008, but he hasn't delivered on his promises, his priorities are out of order, and he does not fight against the republicans. President Obama is not a democratic leader. Whenever he gets criticism he just lays down and takes it. Then he compromises with Republicans whenever they start complaining. While Clinton is not as liberal as Obama, she might actually get some things done. She's a fighter, and that's what this country needs. My Lord!!!! Are we all completely out of our minds? If any one of us spent 8 years getting into a personal financial crisis/employment mess as the previous administration did, it would be inconcievable that we would be able to starighten out the mess in just 1&1/2 to 2 years. And we wouldn't have two wars to contend with and another family trying to saboutage everything we were doing to try to get out of the mess. Pleeease...give Obama not only a break, but a helping hand!!! I voted for Mr. Obama for President. I've found him to be a timid leader and not what he represented himself to be. He's still campaigning and not leading. I get angry everytime I see him in some public forum. This man is the President, but he acts like a house servant with other leaders and the military. Enough is enough. Let's see what his approval rating is next year. It's at the same level at the same point in his presidency as Clinton AND Reagan, and both of those went on to win re-election easily. The country likes divided government. Jack, I'm a die hard Democrat who just voted a straight Republican ticket. My husband split his as a first. Living in California that may not matter much, but at least we voiced our opinion about this current administration. If Hillary runs in 2012, the Party just might get us back. She is currently perceived as a GLOBAL leader.... it would look bad if she were to run against the incumbent.... I don't think it would do any "Change-Hope-Movement" any good. She most definately should run and she should take the gloves off! If it plays out right.... she will face Sarah Palin and get more election leverage for the next house of representatives election on Nov. 6, 2012. Jack . We love you better if you stay in the middle of the road. Sadly, been there, done that, made the wrong choice! She has nothing to gain by challenging him a primary ... unless the likely Republican nominee is Palin. Why not! Hillary has alot more class than palin. I am curious as to what party she might run under. You know, it is no longer just democrats & republicans. We have independents, libritarian, centrist, right wing, left wing, bule dogs, red dogs, hot dogs, hawks, doves, sparrows, christian, atheist, pro life, no life, get a life. And lets not forget all the "do gooder" groups that constantly tell us that we know nothing about the constitution or our rights! I must apoligse for those that I forgot, you know we must be "politically correct" in these matters. If Obama is viewed as poorly as he is now one year from now, it only makes sense that she should run. They're both highly capable politicians. Whoever has the best chance to win in 2012 is who I support. I don't like Obama, and I never have. But as much as I hate to say it – even with the beatdown the democrats just experienced – my Party just doesn't have anyone that can beat Hillary OR Obama. And if my party nominates Sarah Palin in 2012, I'll cover my car in Obama Stickers and have his name tattooed on my arm. Responsible people everywhere should not allow Sarah "I'm a PR disaster" Palin to get anywhere near the White House. It does not matter,as long as we have arrogant republicans who also apparently did not get the message from the PEOPLE. Work together to get America back on track. All eyes will be on the Republicans to see if they can make it happen--they can easily be replaced again--specially the back woods lawyer McConnell. No, I don't think Hillary should challenge him, but rather she should replace Biden. Now that would be a ticket the Republicans would have no chance of defeating. Obama can win a 2nd term with or without her as he's very popular among the Democrats, but she would help a lot among the rest of Americans. It won't matter how the Dem's run, the corporations will buy their own candidate. Yes Hillary should run. While I believe Obama to be a sincere and intelligent man and i was thrilled to death to see an African American as President, I feel his lack of political experience combine with some arrogance, has hurt him in setting his priorities and his ability to negotiate.I think Obama did not realize how his win was based on an anti Bush vote. He did not see that he did not have a mandate, but still had to win the hearts and minds of the people. I feel Hillary has a much better understanding of the art of politics. I love to see her challenge him again talking about Pres, Obama I would vote for Hillary Clinton in a second. Hillary should definitely run in 2012. With the prospects of a deflated Obama, and Rogue Palin and the snide and threating McConell brokering the election, who wouldn't take two Clintons for the price of one? I do not think Hillary Clinton would challenge President Obama for the presidential nomination in 2012 and I don't blame her. She was crucified by the GOP when her husband was in office. Her only sin was that she was married to a Democrat. But that did not stop the party of NO from hurling insults at her. She ia doing a great job as Secy. Of State. I applaud her and she doesn't have that screech owl voice of Mrs Palin! A plus to be sure! out of hell, both of them ending up in a ditch. I would be so glad if she decided to run again. I don't think Obama is electable at this point. He has really lost a big part of the party base as well as independents. As a gay American, I will never vote for him again. I don't see any leadership skills from this man and he doesn't appear to be learning on the job. Hilary, save the democrats!! had hillary been elected insead of obama,those democrats that lost their seats wouldn't be packing their bags right now. i wonder if they think about that? hillary,and of course,bill, would have jumped on this bad economy like a hungry dog,and bill is just the man to turn it around. it before,so he has a blueprint. of course,this would be done with hillary's approval! run hillary run . we need her to save the dems from certain defeat in 2012, because i was a hillary democrat who refused to vote for obama in 08 and now the rest of my fellow hillary supporters agreed. obama is a real embarresment to democrats who are bold enough to tell the truth. Jack, I'm one of those Independant voters everyone loves to hate. I voted both times for B. Clinton and G. Bush. If Hillary has better ideas, and looks like the better leader, you bet I want her to run. If she is the best candidate, count one vote Hillary Clinton. I hope she runs for the nomination and they send Obama off to do something he's qualified for. Perhaps organizing th building of the NYC Ground Zero mosque or suing the state of Arizona for trying to safeguard it's citizens. This question requires only one word as an answer....a resounding "YES"
There were concerns expressed about Hillary's perceived lack of foreign policy experience when she ran in 2008. She is spending 4 years serving in the Obama administration and strengthening that piece of her resume ( coincidence? I think not). If we as a nation are smart and if the Republicans don't exhibit evidence that they actually heard what the voters were saying (which they probably won't), then Hillary deserves a chance. We've had democrats, republicans, caucasians and now an African-American.....they've all failed the American people miserably. Let's give Hillary a chance. Not because she's a woman...so is Sarah Palin but that's a whole other email.... but because she has the intelligence, the experience and will have a whole new approach to governing our nation. Go Hillary in 2012 ! Draft Russ Feingold. President Obama hired hillary's anticipated COS, Rahm Emanuel. it is Rahm that ruined Obama's Presidency. Free trading Rahm and Hillary are both bad for America. We need a leader. America is suffering from a leadership gap. The middle class is disappearing into the growing wealth gap and the only thing the Democrats can worry about is the enthusiasm gap. Somebody needs to connect the dots. I am writing from Illinois and I gathered 400+ petition signatures for Obama's presidential bid. I distributed literature for Senator Obama in the primary election. I felt that Grant Park was one of the greatest moments in Americas history, but I think that giving working Americans false hope simply to get elected was near criminal. We supported Clinton in 2008. We did not vote for Obama because he was/still is not experienced enough to be President. We hope for nothing better than Clinton to run again in 2012, because I believe that the Democrats will lose more Senate seats if Obama is running for Pres. Again. People will not fall for his vague message of change after experiencing it for 4 years. Mitch McConnell needs to worry about his own reelection, not the Presidents…. It’s Republicans attitude that we can do better, that caused America’s to get in the shape we’re in now. I do not think Hillary should run against Obama in 2012. He has done a good job and the American people need to get behind him. They expected a lot for a year and a half. I am waiting for the Republicans to have everything fixed in a year and a half. Actually they did not give the President that long. They have pounded him from day one. The Republicans do one thing well. They are pros at lying. They have shown they are loud and greedy and able to get people to be confused and think they are telling the truth. She's too old to run in 2016, remember how McCain got hammered for his age? She's also one of the most ambitious female politicians I've ever seen – think Tracy Flick from 'Election'. I wouldn't be surprised if she were at least contemplating a 2012 coup. Her biggest problem is convincing people she's not just a white female version of Obama – she was the health care reform champion under Bill's term (he was too smart to touch it) and we saw where that went. I like her style and grit but she would never get past her old skeletons. Absolutely, positively, especially if Sarah Palin is nominated by the GOP- which is highly unlikely. Hillary will definitely 'shine' better for the Dems -than Obama – given his current disapproval ratings. I think Obama will do whatever he thinks is best for the party and American people come 2012. But I dream of a match with Clinton / Palin...how many rounds you reckon? Jack, is it just me or does it seem that Secretary of State Clinton is the only one in the present administration that knows what she is doing and does it well? Just saying! The only way I'm voting democrat for the next presidential race is if Hillary runs. Well, I love them both but after these two years of dealing with Boehner and McConnell, we need to trade in the Labrador for a Pit Bull, and I mean that in a good way for both. Hiallary will chew them a new one and make them like it. Hillary should challenge Obama in the next primary. The Great Concessionist is toast in the next general election. He doesn't have the spine to stand up to the Republicans and for the next two years they will keep attacking him and he will keep taking it. It's sad and biologically impossible, but Hillary has bigger stones than Obama. What polls are suggesting that Democrats want to see a primary challenger for the president? If the incumbent president is going to "be had", it won't come from within his party. He has to be beaten by an opponent from the other side. As far as Palin is concerned, the Republicans would be offering a sacrificial lamb if they nominate her. First, McCain, and now possibly Palin?? Is that the best they can do?? I think Hillary challenging Obama would be great! I wanted her to get the nomination the first time around. She has a backbone and is a go-getter–that's what this country needs! The only reason Obama took a beating on Tuesday was because he compromised too much to the Repubs and didn't deliver on his promises. I think Hillary would deliver! We know Obama he got 47% at his lowest point. This is very high because he need only few more % to win. We should also bare in mind this is his lowest point 47%. Its going to be hard to beat him on the ticket. yes she should run. if the kennedys hadnt cut a deal with obama on health care and turned on clinton,she would have gotten the bid for the president seat.clinton is a very smart woman and should run for president. lets get Bill back in office.... not hillary. If Obama doesn't step up his game, and start working on the economy as hard as he worked to get the job, then Hillary may not have a choice, someone has to do the job! If the Republicans cannot come up with a viable candidate – and it seems that this is likely, then Hillary Clinton is about the only one that can pull this country out of the mess that it's in. Obama has lost all credibility – and I suspect this will worsen over the next 2 years. If someone doesn't stand in – then it will be Obama again – with no support. That would place this country in a much bigger mess. So yes, Clinton should run in 2012. I believe in order for the Democrats to win in 2012 Hillary will have to be on the ticket.Hands down she can pull it off! Imagine Hillary and Sarah having a live debate?It would top all ratings ever recorded! Hillary would make her look like a pre schooler in a senior class! Sure, why not? Otherwise, Obama will run against Palin and "none of the above" will receive the overwhelming majority. No way, Jack. I'm confident President Obama will regain his traction and prevail in 2012. For Hillary to provide anything short of 100% support would be abominable. I voted for Barack during the primaries back in 2008. I will not make that mistake again. I will either vote for Hillary or vote Republican. This man has lied and promised more than he could bring to the table. Shame on him. Clinton versus Palin is the only way I would ever vote for Clinton!! Almost the same as "I wouldn't vote for her if she were the only one running". So much is riding on how the economy will do, Bush let things get all messed up. I am all for the Wall alley reforms and oversight in finacial markets that have such a potential for causing fiscal devastation if not checked and balanced more. If Obama can pull this nation together he will go unchallenged, if things stay the same or worse there will be serious thought and discussion on the nomination. Hillary is a natural and likely candidate. Lets hope for the best in the next two years for all our sakes. One thing that stood out during the campaign wa she was not on the trail- anywhere! It appeared to be calculated- as if she was asked to sit this out in case they need her in 2012. I thought it in August, I think it now. No. If you think Republicans are nasty now, think how much worse they would be if they had to work for a woman? Especially Bill's wife. They, (& the media), would have Americans hating her much sooner than they did with President Obama; I'd give them a week, & after 1 month in office, they would start impeachment proceedings. Hillary is the only hope if Democrats intend to keep the white house in 2012. She is the only Democrat with the support and determination to outrun any Repulican put forth. hey any thing but Sarah Palin! 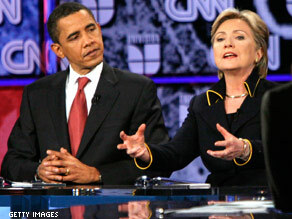 If the democratic prty leaders are smart and wisdom prevails, Ms. Clinton will not oppose President Obama in 2012. I think she will definitely make a move for presidency 2016. By then she will have been the best politician to lead the country and in a position to beat any GOP nominee. Jack, please don't plant this in people's mind. As a Republican-turned-Independant, I would hope she runs on a platform of conservatism. If so, she has my vote. Let me say in no uncertain terms, should that happen, the Republican party will win again. Let me sound this warning: Do not fall asleep on Sarah Palin, the Tea Party or the Republican party. People may not think Palin is Presidential, but with the state of the union right now, stranger things have happened. This is America after all. All Sarah needs is a really big idea to run on that appeals to the people the likes of which Regan had with supply-side economics and Obama had with hope and change. Remember the Carter-Kennedy election? It took the Democrats about 12 years before they could again secure the nomination. The Republicans are finding their confidence again. It would serve their best interest to see the opposing party fracture in all kinds of ways. I think it is really dumb to even suggest challenging the President. The President did a great job in fixing 8 years of mess. Lets see what the Republicans can do. If Hillary wants to be on the ticket, Obama/Clinton ticket will make more sense. Otherwise, it will be a big mess. I don’t think Hillary would be able to win the primary. Historically, it’s just way too hard to do that. The incumbent president will win the primary but, as history indicates, will very likely lose the general election. Incumbent presidents who face serious primary challenges come out bruised and battered, so incumbent primary challenges are only of benefit to the opposition party. If Hillary really wants to be president, then, from a political standpoint, she’ll wait until 2016. Running against Obama will only further solidify what, if the election were held today, would be a Republican victory. Dumb, dumb, dumb! The Great Clintons didn't come close to what Obama has acomplished. Afordable Health Care for the Sick and not so RICH! Obama should step aside and let HIllary run. She is the only one that can win in this upcoming election, because of the conservative upswing. Most people realize that she did well in most of the regions that House members and other politicians lost their seats, and Obama did not. She can carry the Democratic base just as well, or better than Obama can. (Yes she did win the popular vote in the primaries). Hillary would do far better bringing back potential Independent and Republican voters because of her experience and proven ability to work with others outside her party. If Obama doesn't step aside, I think Hillary should challenge him in the primaries. Obama is in a bad spot but he is not dead politically. If he gets back up above 50% approval rating - and he's only in the low 40s, not down in the 20s as Bush ended up - then he's on solid enough ground to win a second term. Besides, how would Clinton run? She'd have to step down as Secretary of State, a position in which she is needed... this would leave her open to charges of selfishness, party-splitting, etc. Same as 2008 where she became the villain, right before she conceded. No... unless Obama really falls apart, he will stand for reelection and Clinton's only real option is to wait for 2016, if she still feels up to it at that point. Hillary challenging President Obama in 2012 would be collateral damage with one intended target, Sarah Palin. I think we'll see the Republicans distancing themselves from the Tea Party to avoid Palin as their nominee. She's Obama's secretary of state. Not going to happen. But swapping jobs with Joe Biden, in time for 2012? Yes. We would be better off today if she had won the nomination in 2008. Why wait an extra 4 years to get a much more qualified woman in the Oval Office. YES! Hillary Clinton should run in 2012, and defeat President Obama as then-Senator Ted Kennedy tried to defeat President Carter in 1980. If she fails to get the nomination, it would be most likely that the Republicans may have a chance for them to defeat President Obama as what happen in the Presidential Election in 1980. I am a Democrat 100% and was very upset by the party electing Obama for the Dem ticket, I didn't want to vote for him but as a Democrat I backed my party, I would never think of voting Republican or Independent or for that matter in the future Tea Party. The Dem Party should know that Obama will never get elected again he is a ONE AND DONE President he's horrible! I wanted Hillary before and I will gladly stand up for her again in 2012. I sure hope she goes toe to toe with Obama and then once elected to the Dem ticket she sends ole Sarah back to Alaska where she belongs! hi Jack i am from Toronto/Canada and i am so much into American politics..been following Obama and Clinton for many years now and i must say that Hillary should run, thats the only hope democrats has to keep the white house. Obama too inexperience to take that 3am phone call. It's a tragic thing to be bullied! Obama better get a better corner. Alert the corner he has a bad brow cut. Palin is an enemy of the American people. Any true patriot would ensure that she never be allowed to run for office! I hear Russ Feingold has some time on his hands. He'd get my vote. I think Hillary is the best bet for the democrats in 2012. President Obama honestly doesn't stand a chance. As far as he's fallen the past two years, it would be absolutely insane for her to back down. Even when she lost the nomination, the manner she took the loss and backed her rival made her more presidential than he could even dream of being. I say, Hillary 2012. If the best that the democrats have to offer for president is Hillary Clinton then they are in worse trouble then anyone ever predicted. President Obama uses the reverse Kentucky Tea party jack-boot stomping technique that we saw on the news on Rand Paul. I'd vote for Hilary in a heartbeat. And a Hilary vs. Palin election would be the most fascinating event in US political history. Though I think it is more likely to happen in 2016 than 2012. If Palin is nominated in 2012, and you can bet that Boehner and his henchmen will do everything in their power to prevent it, then Obama has a second term for sure. I'd love to see it, but why on earth would she want to put herself through that process again? We're the stupid ones for getting it wrong in 2008. The reality is not matching the promise. And if I hear Obama say "folks" one more time, I'm going to spontaneously combust! YES! She should have been the nominee in '08! Do you all remember when Presedent Clinton said electing Obama is like rolling the dice. Well we all live to see the dice now rolling. Obama was just punished for not being able to repair the damage caused by Republicans by giving Republicans more power. Its like a bad joke. Conservatism like Communism doesn't work in a democratic system, sorry, but you will soon find that out again. Tax cuts with out spending cuts, brilliant. I don't care who runs. Fix the damn debt, Medicare, and Social Security programs!!! Obama for president, Hillary Clinton for vice president. An unbeatable ticket. Biden's a nice guy. He'll step aside. This is preordained. As a Republican, I hope she does run, because Mitt Romney can beat her (or Obama) in his sleep. Sarah Palin will not be the Republican candidate, only the Tea Party supports her. Romney will win in 2012. He has the financial know-how to turn this country around. If we are talking about Hillary Clinton running again as the best the Dems can do, we had better get used to say "Yes Miss President PALIN". Hillary needs to wait until 2016 one way or the other. It's not going to matter anyway because as soon as unemployment starts to come down and the economy picks up Obama's numbers are going to be right back where they should be. This is an absurd idea. She might get the nomination but only at the expense of tearing the Democratic party apart and that would significantly diminish her chances of winning in the general election. Hillary is smart enough to know this. She would never do anything so stupid. As long as she's a Democrat she cannot be trusted to do anything different than Obama. Let's remember her role in HillaryCare. Do you really think she's that different from ObamaCare? The Clintons are poison. Period. I voted for Hillary in the primaries along with a lot of the gay community, as well as seniors, women and middle class workers. If President Obama, whom I support, doesn't appeal to more of our needs – going back to Hillary is the obvious choice! And bad news for Obama, if there is a primary between the two, my vote will go to Hillary. Americans want immediate gratification, which could not happen in the middle of this economic crisis, even if Obama had a cooperative Congress, which, of course he, did not. No-one, President or otherwise, can turn it around in two years, and probably not four. Not when the economy was that far down. Also, we are a global economy so there are many factors contributing that no-one here controls. The American people want it all and they want it now and since that can't happen, they will always be easy targets for Republican manipulation driven on fear and anger. Nominate whoever you want – a Democrat can't win. I like this country less and less – and before anyone starts, Yes, I am actually considering a move out of the U.S. so I can sit with so many others in the world looking at the spoiled, oblivious Americans. As with the Kennedy's; it will be a glorious day when the last Clinton leaves political office. I hope the Dems suffer a bigger defeat in 2012 that Jimmy Carter even thought about. Hillary was always my choice. She was pretty quite this election. Something up her sleeve? I think Hillary's ship has sailed. So much depends on how congress and Obama work things out. It will be uphill for the Democrats in light of the new focus on traditional American beliefs and principles. If success blooms anew and things start to get right again, the Democrats won't have a chance. Hillary and her impeached husband should start to fade by 2012. Obama is going to easily win re-election, there isn't one powerful GOP candidate. Obama will rebound, he's been counted out many, many times before. Right now it's funny, I think he's being underestimated. When he's on the ticket, young people will VOTE and there will be more of them in 2012, But there's nothing wrong with dreaming. Yes she should Jack, If Canadians were allowed to pick the candidate's we would have made the right choice and picked Hillary to begin with. You Americans always get caught up in the hoopla of celebrity. You never think of the consequences of your actions. Now you’re living with them!!!! I hope that taught you all a lesson, and Hillary fixes this mess in 2 years. I just hope and pray the narcissistic demagogue named Palin never gets nominated for any public office ever again. Obama blew it - he needed to focus on jobs first and foremost - so unless a miracle happens and Americans get back to work he won't be electable. Clinton may or may not be viable - the next year or so will tell. We need a "stateman" or "stateswoman" and we don't have anyone, not anyone, worthy of that name. If Hillary is on the ticket, she gets my vote. Period. I don't know how an Obama – Hillary race would go over. I think it would probably divide the party, but I still think she is far-better qualified than any potential candidate from either party. How in the world can you take damage over the course of eight years and think that everything will be fine and dandy in two. If the auto industry and the banks completely failed, do you really THINK the stocks would be close to 11,500 pts, compared to March 2009 near 6500 points. A smarter move would be to stick hillary in for VP. The recent "Auction" allowing the repubs to gain the house will only help the Dems in 2012. Nothing will change and will most likely get much worse thanks to the feds printing $600 billion worth of toilet paper! Prepare for WW3 or learn to speak Chinese people. Oh, and might want to learn how to survive on a dollar a day's wages! Definitely Hilay should run for president again and as often as it takes to get her in. Her qualifications are impeccable. I supported her before and will continue to do so....imagine where we would be had she won instead of Obama? I have always been Republican, however, Secretary Clinton might be the one Dem I would consider using my vote in 12. She gets it. If all the Dems and Independents had elected her vice the Big O, I really doubt we would be in this mess. This president couldn't win a race against a crippled Jack Rabbit! He's out of touch, weak, uninformed and absolutely cowardly in face of the Republicans. At least Hillary would be able to "man-up". Obama is an empty suit. An intellectual wuss with absolutely no understanding of how to run a government. The middle class will soon be gone and will all be working for the Chinese as more and more jobs and technology are shipped overseas. Mr. Obama should resign, move to an island and get out of the way! Run Hillary, Run! I would love to see that! Run Hillary Run! She would NEVER win. Democrats cant win if African Americans stay home and they would. President Obama has been a good, smart, hardworking, attentive leader that is respected around the world. Under those circumstances, blacks would cut the political throat of anyone that opposes him. He has earned better treatment than that. He is the reincarnation of Jimmy Carter. Carter was challenged by Ted Kennedy and, while winning the nomination, was overwhelmed by Reagan. I suspect the same will happen for Obama. You're all dreaming...we've just about had enough of the "minorities in charge experiment". It's time to have REAL STATESMEN get up and take the lead here! Our country is either going down the drain or into revolution!! Soon we may be speaking Chinese, Russian, or bowing to Mecca two times a day! Wake up America–we need honest leadership, not big money backed politicians!